Ask: Have you ever been in a situation where you had to completely trust God to protect you or save you? Ask: Is it ever difficult to trust God? Why or why not? Say: We’ve been hearing the story of God showing His power to Pharaoh and all of Egypt. Through the 10 plagues God had shown that He was more powerful than the false Egyptian gods, and only He is worthy of being worshipped. Ask: If you were an Israelite and had witnessed all of the plagues, how do you think you would have felt about God? Say: In today’s story we’ll hear how God finally brought His people out of Egypt. God provided a way of escape for them in an amazing way. Pray that God would open our hearts to His word this morning and we would be amazed at His provision for the Israelites and reminded of how He has provided a way of escape for us today. Say: After God sent the 10 plagues upon Egypt Pharaoh finally relented and allowed the Israelites to leave. They were finally freed from slavery after being in captivity in Egypt for 400 years. Say: That’s right! Moses led the Israelites from the land of Egypt into the wilderness. They were completely dependent on the Lord to show them where to go. They eventually came to the shore of the Red Sea where God told Moses to set up camp. Meanwhile, back in Egypt Pharaoh began to regret letting his Israelite slaves go. Now who would do all their hard labor? Pharaoh readied his army to chase after the Israelites and bring them back. Ask: How do you think you would have felt if you were an Israelite and you looked up to see Pharaoh’s army on one side of you and the sea on the other? They had nowhere to go! Say: They were afraid and said to Moses, “What have you done to us by bringing us out of Egypt? It would have been better for us to serve the Egyptians than to die in the desert!’” The people didn’t trust God, but He was about to provide a way of escape for His people. Say: Let’s read from God’s Word to hear what Moses said to the Israelites. Say: Then God told Moses to raise his staff above his head and stretch his hands out over the waters of the Red Sea. Suddenly the waters parted on two sides, and dry land appeared in front of the people! What a miracle! 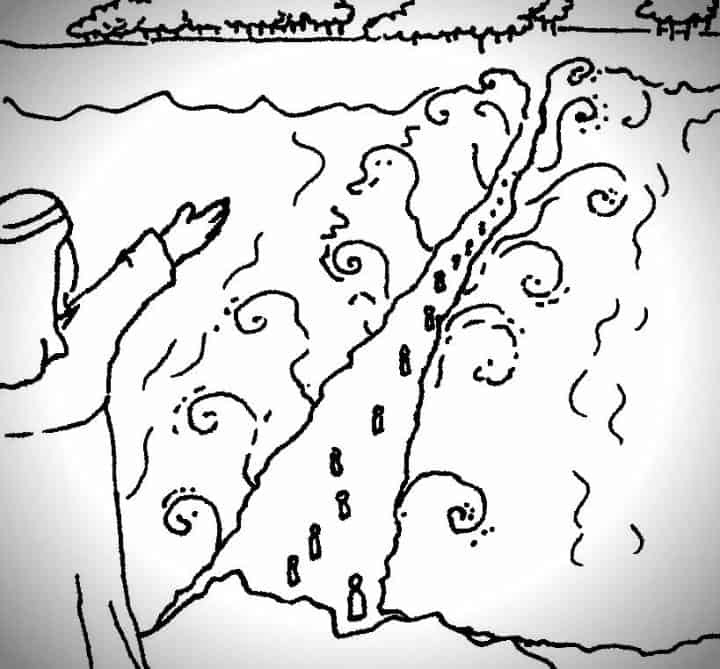 Moses led the people through the middle of the Red Sea safely to the other side. Say: Pharaoh’s army continued to pursue God’s people, but as soon as the last of the Israelites was safely on the other side of the sea, God caused the waters to come back together, covering over the Egyptian soldiers. Say: Let’s read from God’s Word again to hear how the Israelites responded to God’s protection over them. Say: God showed the people that they could trust Him. He is a good God and loves His people! He wanted to take care of them and see them brought out of slavery so He could give them a better life in the land that He would provide for them. Ask: Did you know that we are a lot like the Israelites? Say: The people in the story were trapped by Pharaoh’s army and the Red sea. We might not be facing an army, but we are trapped by sin! Sin holds us all captive, but thankfully God provides a way of escape for us too. God saves us by sending Jesus to die for our sins. When Christ was crucified He took all our sin and shame on himself and took the punishment that our sin deserves. When He was raised back to life Jesus defeated sin and death! Now when we put our trust in Jesus we can be freed to live the life that He wants for us! Say: We can trust God to protect us and always provide a way for us to escape sin! Do you think it would have been hard for the Israelites to trust God? Why or why not? Have the kids cut the blue sheet in half and make 3-inch cuts down each edge. Use the scissors to curl each of the cuts so they look like waves. Glue the blue pieces onto the brown so it looks like parted waves with dry ground underneath. Have the kids write “God provides a way of escape for His people” on the brown piece that shows through. The class will line up on one side of the room with the goal of getting everyone safely to the other side. The trick is, the kids can only step on the construction paper as it’s laid down in front of them. The first child will lay down a page and step on it, then will reach behind them as the next kid hands them another sheet. The first child will lay it down, step on it, and the second child will step on the first sheet. Have the class continue in this way, laying down new sheets and traveling one child at a time till everyone is across. Tony Kummer (Editor) reviewed & updated this page on : November 16, 2015 at 9:21 pm. All our content is peer reviewed by our readers, simply leave a comment on any post suggest an update.